Maryland Winds Concert: My Favorite Things! 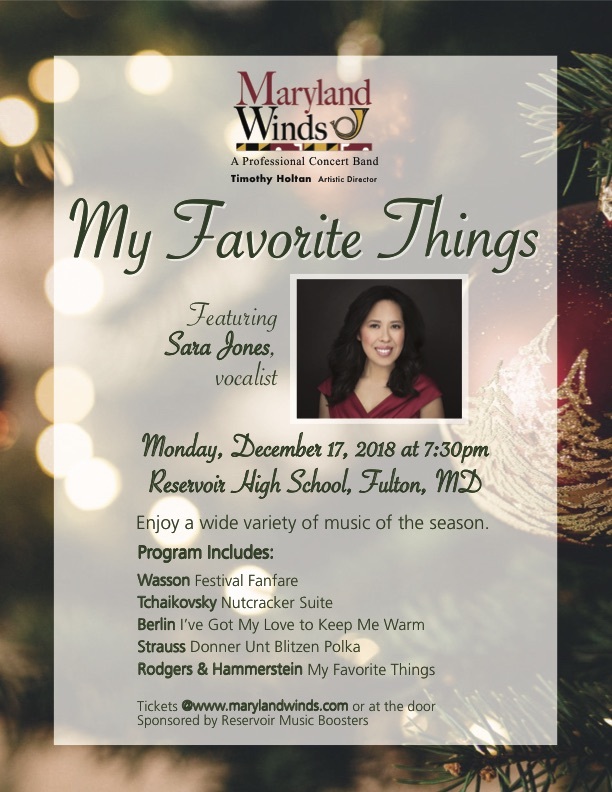 Join our friends from Maryland Winds at Reservoir High School, Fulton, MD on Monday, December 17, 7:30 for a performance of MY FAVORITE THINGS featuring Sara Jones, vocalist. Enjoy the smooth vocal stylings of Towson State University faculty member Sara Jones, as she and the Maryland Winds present a delightful collection of seasonal music. Posted on November 20, 2018 December 5, 2018 Author PJ OttenritterCategories Area ConcertsLeave a comment on Maryland Winds Concert: My Favorite Things! 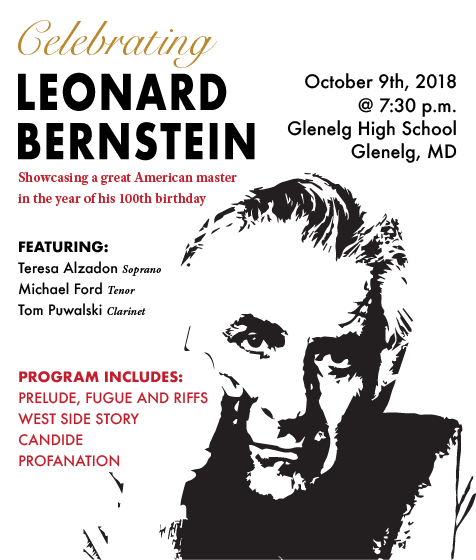 Jordan Kitt’s is pleased to announce a special concert event by our friends at Maryland Winds on Tuesday, October 9th at 7:30pm at Glenelg High School in celebration of Leonard Bernstein’s 100th birthday. 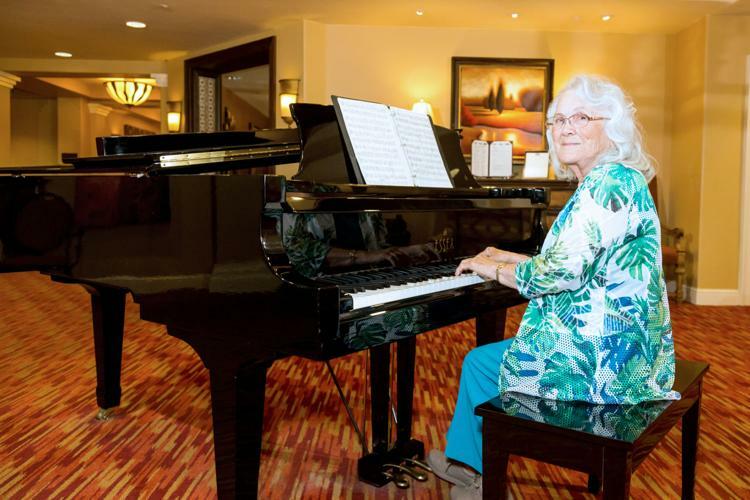 They will showcase a great American master in the year of his 100th birthday. This exciting season opener features the intoxicating music of Leonard Bernstein. Teresa Alzadon displays her vocal pyrotechnics with the dazzling Glitter and Be Gay. Relive the rivalry of the Jets and Sharks as Michael Ford tantalizes with snippets from West Side Story. Clarinetist Tom Puwalski will amaze with the jazzy Prelude, Fugue and Riffs, written for Benny Goodman. Get tickets or more information here! 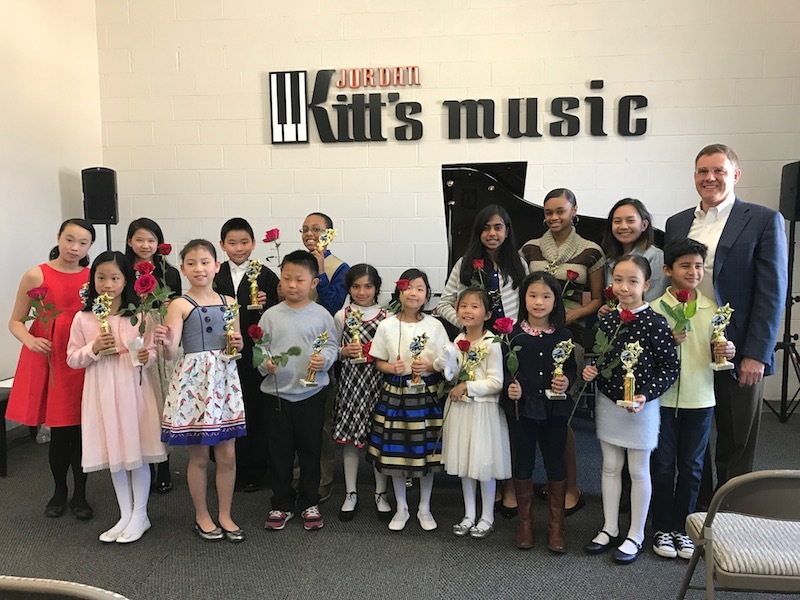 See what’s new and exciting at Jordan Kitt’s Music Education Centers with this Fall preview newsletter. Follow this link to view the .pdf online! 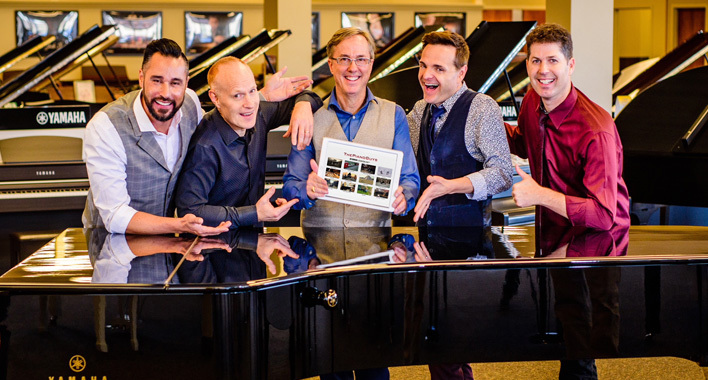 The latest Piano Guys “live” at Jordan Kitt’s Music in Fairfax, 7pm on 8/6! Having amassed billions of views and millions of followers, The Piano Guys have become one of the most successful instrument music groups ever to grace the Internet, while capturing the hearts of music fans as they tour worldwide. See them in a virtual performance along with Yamaha’s Craig Knudsen at Jordan Kitt’s Music on August 6th at 7pm. 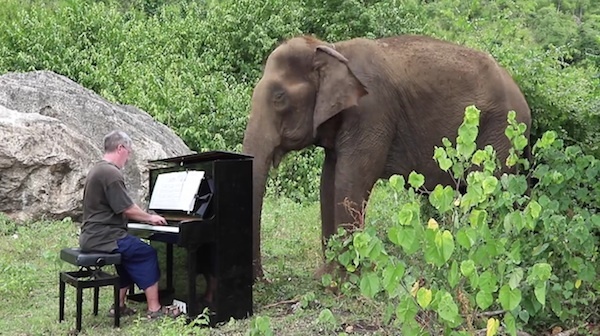 The meteoric success of the “Guys”-pianist Jon Schmidt, cellist Steven Sharp Nelson, video producer Paul Anderson and music producer Al van der Beek-came about from more than 60 breathtaking videos. 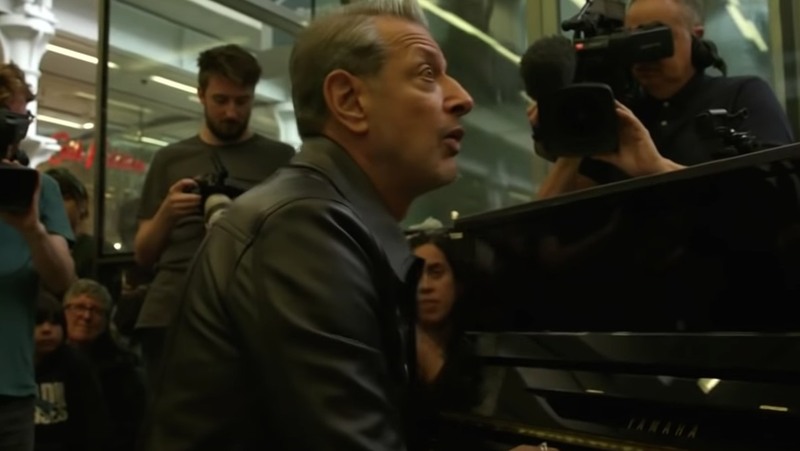 The talented group performs their unique brand of classical, contemporary and rock and roll music in locales where a piano has never gone before-from atop the Great Wall of China and a speeding train, to the edge of a 1,000-foot cliff in the Utah desert. At Jordan Kitt’s Fairfax showroom and Music Education Center at 7pm on August 6th, six of The Piano Guys’ most popular viral videos move out from the screen, to be experienced for the first time as simultaneous television and “live” piano performances in the homes of Disklavier owners around the globe. These DisklavierTV performances, as they are known, put a bright spotlight on both the amazing talent of The Piano Guys and the Yamaha Disklavier, the world’s most technologically advanced piano. 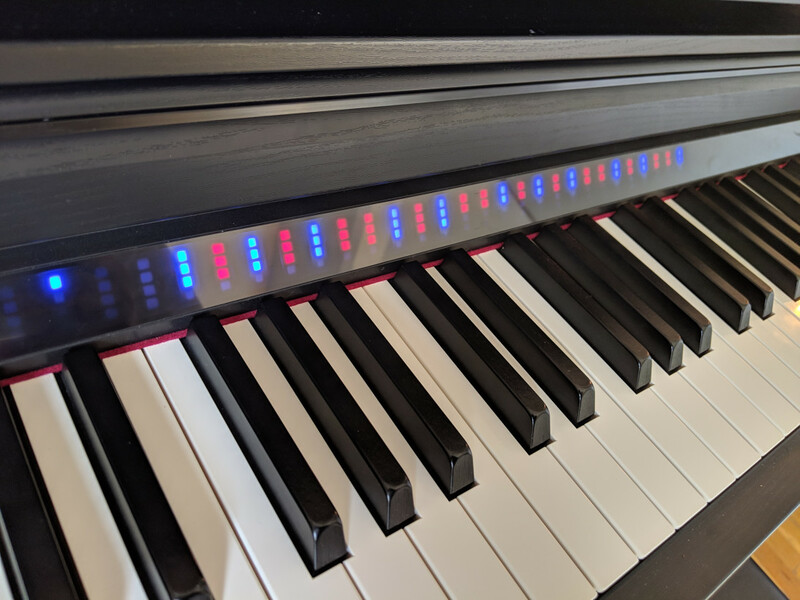 The Disklavier is a remarkable high-tech reproducing piano that can transmit highly-nuanced performance data – the actual keystrokes and subtle gradations of pedal movement – between similarly equipped instruments over the Internet. As an artist performs, their precise note-for-note performance data is captured, then streamed to similarly equipped remote instruments anywhere in the world, where it is recreated exactly as the artist originally intended. The end result is nothing short of spectacular. 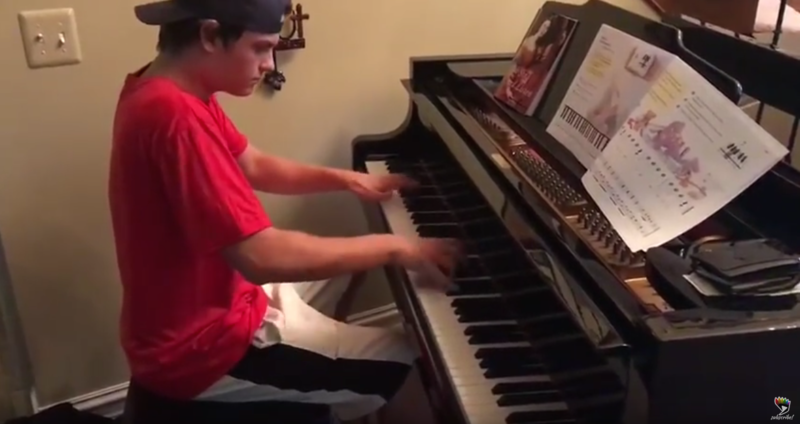 As fans watch and hear Schmidt and Sharp Nelson trade piano and cello jabs on the big screen television, Schmidt’s actual piano keystrokes are faithfully recreated, note-for-note, on the connected Disklavier at Jordan Kitt’s Music. To make the experience even more authentic, Van Der Beek meticulously removed Schmidt’s acoustic piano part from the original audio recordings, while Knudsen replaced it with Schmidt’s performance data that enables playback on Yamaha Disklavier pianos. Posted on July 18, 2018 August 8, 2018 Author PJ OttenritterCategories Area Concerts, Company NewsLeave a comment on The latest Piano Guys “live” at Jordan Kitt’s Music in Fairfax, 7pm on 8/6!